Grove Gardens and Open Farm, Kells – 19km – with over four acres of gardens showcasing the clematis walk housing over 300 species of small and large flowered hybrids and herbaceous climatic. The rose garden has over 400 plants of French, English and modern roses. The tropical bird garden and mini zoo is a recent addition to Grove Gardens. A large variety of exotic and rare breeds of birds are housed in purpose built aviaries designed to become part of the gardens. Facilities include tearooms, picnic areas, shop and garden centre. There is full wheelchair access. Loughcrew Gardens, Oldcastle, Co Meath – 37km – with its wonderful gardens and walks , coffee shop, adventures course with zip lines, assault courses, climbing walls, crystal maze to name but a few, this is a great day out for young and old alike. Belvedere House and Gardens and Park, Mullingar – 51km – nestling in 160 acres of magnificent parkland on the shores of Lough Ennel, this is a fantastic days outing from Athlumney Manor B&B. 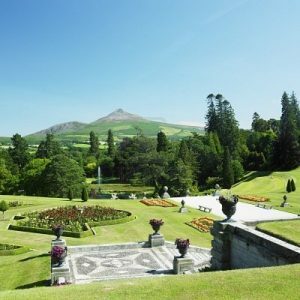 Powerscourt House & Gardens, Wicklow – 80km – a full day’s activity awaits you at Powerscourt House & Gardens. The journey is by motorway and the slighter longer distance is well worth it. From its magnificent house to its immaculate gardens and waterfall, the day’s enjoyment is guaranteed.